Use: intensive chilling chambers are intended for decrease temperature inside a hot product (70oC or 80oC) to packing temperature of 8oC or even 6oC. Making: chambers are equipped with water spraying system, intensive draught system end cooling system including chillers. Depending on the operational use conditions, chambers can have both entry doors and exit doors, too. In order to fully fulfil its task, the chamber has different ways of work which are set as individual steps in chilling process. Everything is controlled by the microprocessor which can be equipped with a central control and registration system (connected to a PC). Chilling process begins with intensive water spraying. It is the first step which is necessary before start the chiller. Water spraying process can be set either on timer or on set temperature which should be reached. In the case of sausages very often water spraying to reach the set core temperature of 40oC or even 35oC method is used. Next, the programme goes to the second step which is intensive chilled air circulation. In order to do that the chiller and the fans mounted above each trolley are started. 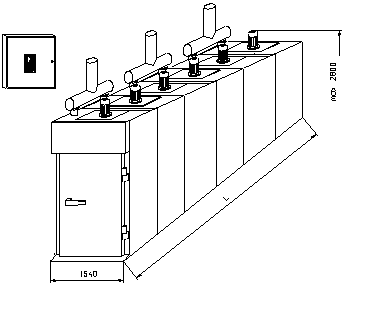 This step can be controlled both with the timer or by reaching set core temperature. During the intensive chilled circulation process occurs spraying of clean water in the form of mist which is put into circulation. It is air humidification. Value of air humidification is a parameter set in the computer. There is no problem to set the pause in chilling in order to change the temperature gradient inside the product at any time of work of the chamber. It is worth mentioning that quick transition of the critical temperature areas between 40oC and 20oC is very important. Regarding the chilling speed, the following chart shows an exemplary effect during chilling of sausage in natural casing 32 mm in diameter. 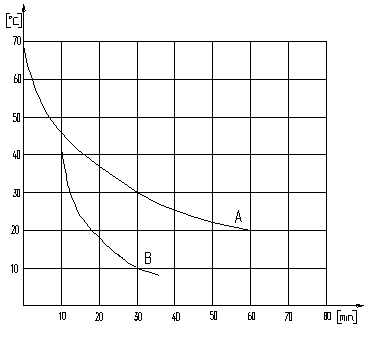 The „A” curve is chilling with traditional spraying, the „B” curve represents chilling with the intensive chilling chamber. For comparison, suasages in casing 80 mm in diameter chilled to 6oC need 1h 20 min.